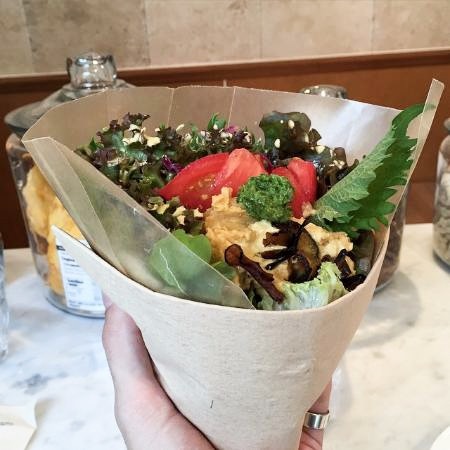 Hummus – yes, Tokyo nearly let you forget about it didn’t it? Falafel, too, now that we mention it. In a food scene as vibrant and varied as Tokyo’s, how is it possible to have not come across a falafel shop, seen hummus on any one menu, or a grocery shelf, no less. 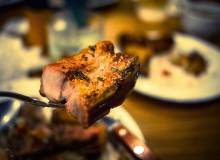 Possibly because there is an entire subsection of cuisine largely unrepresented in Tokyo – Mediterranean. Falafel, hummus, baba ganoush, tahini, tabbouleh, pita – all missing pieces of the food equation. Why? Whether it is a texture unparalleled in the Japanese diet or the involvement of a host of unfamiliar ingredients, we may never know. Either way, it hasn’t quite caught on yet. However few and far between our chickpea options are, this vast metropolis does manage to produce two shining stars in falafel cuisine, even in such troubling and disheartening times for the chickpea. Namely, Falafel Brothers and Kuumba du Falafel. Although they share the same motivation – making great falafel – they’re distinct in vibes and flavors. 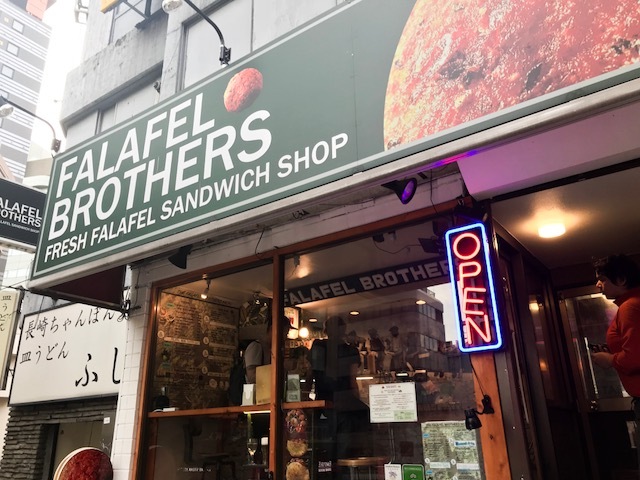 Just a skip away from Roppongi Station, Falafel Brothers has all the makings of a health food shop. Don’t think their dedication to healthy eats has led them to compromise on flavor, though—it is obvious they have put thought into every item on their menu. 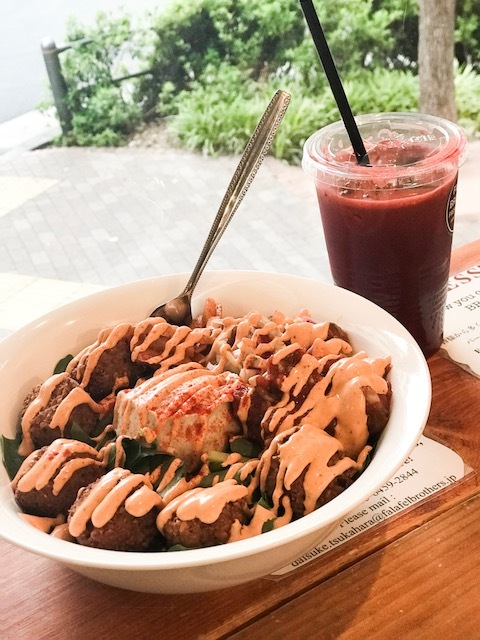 A decidedly vegan and gluten-free friendly establishment, Falafel Brothers seats four patrons at a time (don’t all the best hole-in-the-wall eateries) and has a diverse menu, from freshly pressed juice to vegan ice cream, not to mention their namesake falafel. Make sure to try a little of everything. On their sizable menu they serve freshly-pressed juices, a fala-burger, hummus sandwiches, pita sandwiches, western-style salads with the choice of kale, spinach or iceberg, and rice plates, all with their namesake falafel, not to mention a plethora of sides to accompany their hummus and falafel dishes. I opted for the salad, served with six pieces of falafel, as well as hummus, tahini dressing (go for the spicy) and a choice of three other toppings from their deli case. I chose the “crazy carrots” (seasoned with cumin and cooked tender), as well as the “crunch salad” (a celery mix), mixed-berries and other goodies including a tomato salsa of sorts. The combination of flavors was excellent and the falafel well-seasoned and packed with flavor. The cherry on top? Their vegan ice cream. Honestly it is some of the best I have had in all of Tokyo, a pleasant surprise considering it isn’t a specialty of the shop. It is made from almond and coconut as opposed to the usual soy base, and was topped with vegan caramel (you heard me) and walnuts. It. Was. Amazing. On your falafel-ing stroll make sure you stay sharp, you just might miss this little store front. 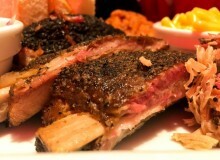 Kuumba is a quaint little hole-in-the-wall situated west of Shibuya Station. 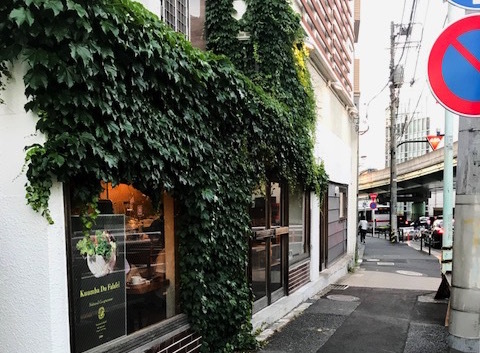 Camouflaged under a wall of ivy, this little storefront is inconspicuous but rewarding. 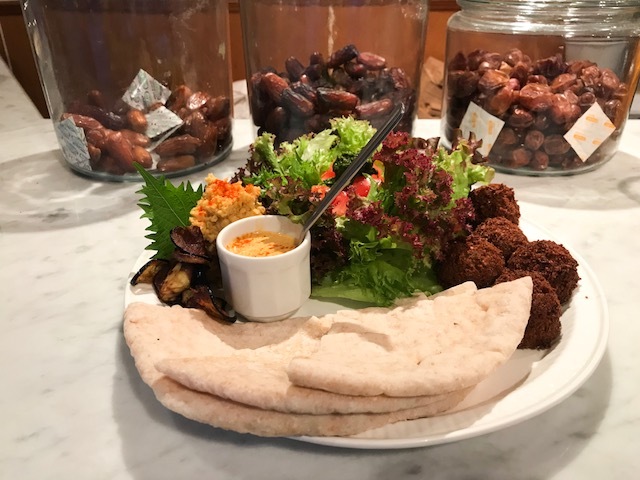 Kuumba du Falafel has a tranquil, Mediterranean feel with tile floors, stucco walls, and a counter littered with jars of dates, nuts, and other dried fruit. 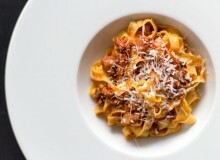 The shop seats about 15, with attentive staff and a small yet focused list of dishes. You can choose from a plate, a whole or half pita sandwich and a few sides, including hummus. Kuumba du Falafel is understated and authentic with a focused menu, and all about the flavor of the chickpea. The falafel is delicately seasoned, really letting the flavor of the chickpea come through. Here I had the falafel plate, accompanied by pieces of hearty pita and crisp greens. It is also served with hummus, tahini, pickled red cabbage, and fried eggplant – a great finishing touch. They serve sides of the most authentic hummus I have eaten in Tokyo, too, topped with pine nuts and drizzled with olive oil. I highly recommend. Its consistency is akin to some of the best hummus I have had: just thick enough to appreciate the chickpea, but still creamy enough for dipping. Make sure to leave with a container of dates for dessert. The owner was nice enough to mix the three varieties available for me in a little togo box. If you have been missing Mediterranean cuisine, Kuumba du Falafel and Falafel Brothers will never disappoint. Don’t let the lack of competition fool you, these two shops are pioneers in the (hopefully burgeoning) Mediterranean scene in this fair city. To long-time fans and the newly converted, there is something for everyone here.